A while ago Michael Quinn Patton urged us in one of our Young and Emerging Evaluator posts to share the 10 evaluation classics that inspire us most. And now we have the great phenomenon on Twitter – #SHELFIES! That special shelf of books you most often refer to in your work, or your life in general! I read a lot for professional purposes. I believe one can only be a good evaluator with some ability to understand the ‘bigger picture’ within which we live and work, and with a very sound ability to integrate – including between different perspectives, experiences, and value and knowledge systems. So, I like to read beyond what is purely technical, although that is of course necessary too. 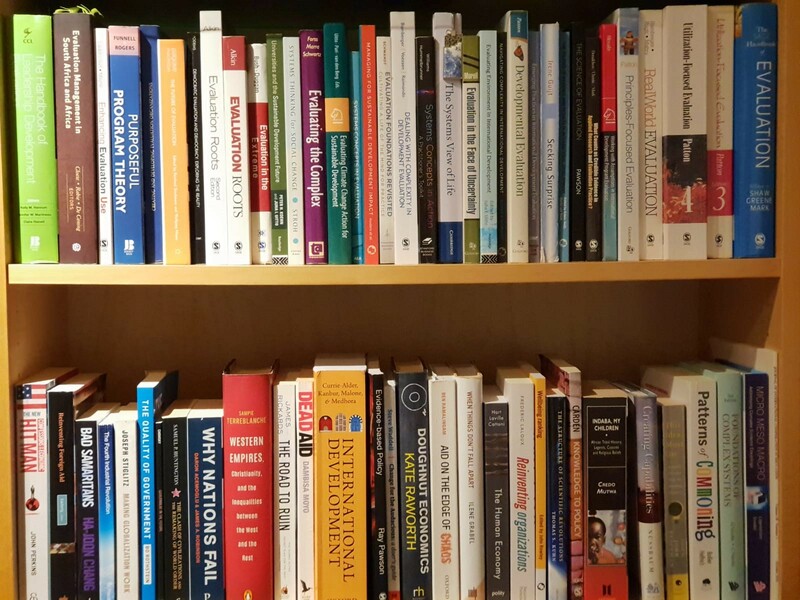 So here are some snapshots of my shelfies – those with my most beloved professional books as well as some I feel I should read in order to be well informed. Click on the image to view the larger version. My most referenced evaluation books are at the top; only some of my most referenced general technical and political books at the bottom. 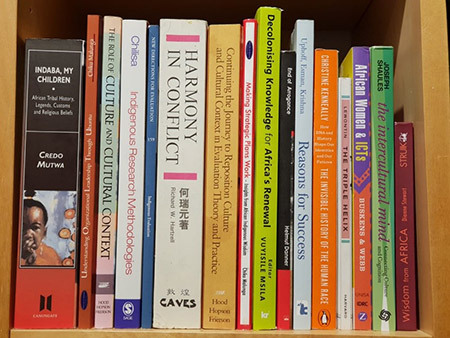 You will see lots of complex systems related books among them, and also those that have shaped some of my realities in Africa and the Global South. These are only a portion of my most referenced books for dealing with culture and evaluation. I need to write more about Made in Africa Evaluation which I have been promoting since 2007 with my great colleague Sulley Gariba of Ghana. AfrEA and many African colleagues are increasingly engaged with it, informed by the pioneering work of indigenous evaluators in North America, New Zealand and elsewhere. 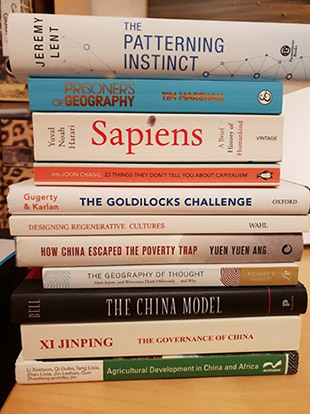 And these are only some of my most used books, primarily for dealing with China’s development (which I will soon write about in a new blog series) and the need to break out of conventional mental models and dominant narratives. And ‘The Goldilocks Challenge’ is there because I remain amazed at how people relatively new to the evaluation field reinvent wheels, yet also bring some new perspectives and angles that can be useful. So, what are your #shelfies? « Evaluation for Transformation 4. The one big mindset change we need in 2019.